I sent a note out earlier today to my subscribers, suggesting a $4 target in the weeks ahead. The count on the chart below suggests a range of about $3.90 - $5.60 for this measured EW move. this is great news for nnvc, wouldnt it also be a nice form of funding for other orphan drug companies like sngx, actc. are there any other companies you are watching who will/could benefit from orphan drug status? 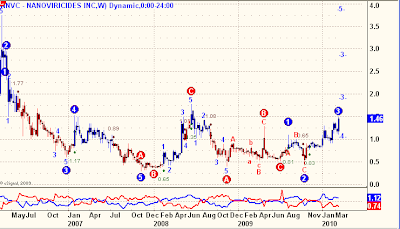 Allan, is this EW wave count part of an upward move wave count?? Take a look at this article. If NNVC has anything to treat this virus, we won't be able to count our riches. READ THE FUTURE ALLAN AND THANX FOR YOUR CLUE AS WE HAD LOADED OUR TRUCK! Whats the point in 'emailing your subscribers first' if you are going to put it on the blog two hours later? What's the point? Subscribers will always get a heads up, however, some information will be more time sensitive then other information. Example, GNVC at 1.75 running to well over $2 before it appeared on my Blog. Plus, the benefit of having about 40 different ETF's and Stock trends clearly defined with reversal points, each night with comprehensive reviews and picks each weekend. That's the point. Thanks for the plug. Allan, I've been reading the IHub board and there is considerable talk about locking in gains off today's large percentage move. I'm not seeking trading advice, but do fall short in being seasoned enough to fully understand the ups and downs that a move like this could generate going forward. I'm sure that no two shareholder's circumstances are the same so here is a quick outline of mine. I hold 3X your suggested position, I have enough cash to take care of my trading needs in the days and months ahead and any profit taken would have to sit idle while I searched out new investment choices. With the huge reward potential shadowing the elevated risk of this type of stock, I can't find enough reason to be selling off a portion of my position in order to lower my risk exposure while in return taking on the risk of losing a hugh profit potential. I hope my thinking is not naive or just plain stupid! Ive found Allan's efforts toward his subscribers has been far beyond the efforts of any other newsletter I subscribe to. most newsletters update intraday maybe once if at all. 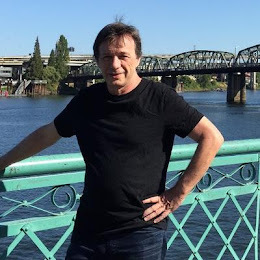 Allan updates several times a day.plus after the market as well, plus what he puts on the blog. And this newsletter is just coming its stride ,evolving every day. why not just be thankful that we even Know about NNVC ,months ahead of the public curve. My thought today....was that I absolutely will send him 10 thousand When NNVC makes me rich. and I'll feel good to do it. Why not just use the Daily Trend Model of NNVC, so that if and when a Daily Sell signal occurs, you sell 1/3 of your holdings to, "lock in gains" and buy them back on a subsequent Trend Model Buy signal? Seems like a simple enough solution, purely objective, avoiding the stress of holding onto a massively profitable position. Thanks Allan! with simplicity comes stress abatement. That is sound, rational logic. Your thought process and approach methods are respected and well received. This is why I am a very satisfied subscriber to your service. I tend to agree with Allan and the IHUB folks. Lock in your gains today. No stock goes straight up. Just know if you sell you risk missing the rise back. The daily sell @ 1.18 (end of day) protected from little further downside to 1.10. The subsequent daily buy (end of day) was @ $1.50. Unless you set your buy trigger instantly you just lost a big percentage 27% gain. With an explosive stock like this it is not easy to manage moving in and out of. Hence I just buy and hold...thinking 5 years/long term like Allan suggests. I notice your chart goes back to 2006, when the float was 22 million. Now it's 73 million. Technically, it's like comparing two totally different stocks in order to come up with a future price of one of them. One wave has nothing to do with the other. It was also a pink sheet issue at the time, which added to the volatility. To predict the value of the float is going to jump to six times what it was four years ago is simply baseless.